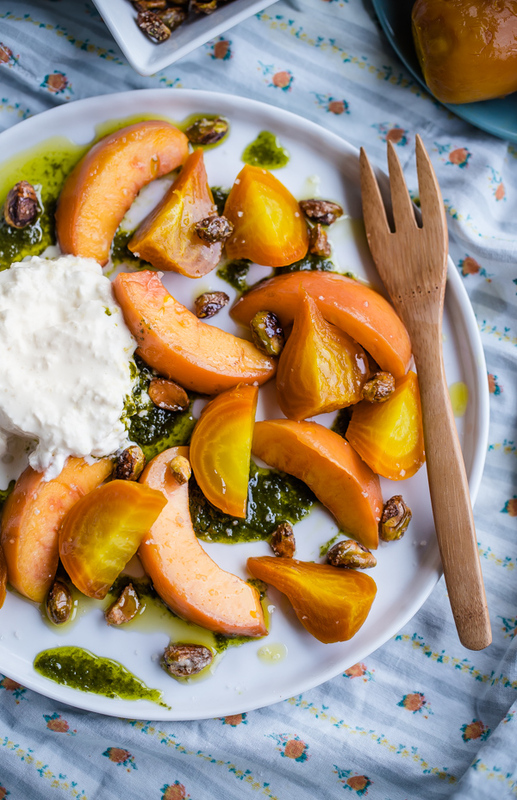 This stunningly simple roasted beet, peach, and burrata salad garnished with homemade basil oil and candied pistachios is sure to impress! Can I ask a big favor of you all? Go out and buy peaches. Like now, and then go home and make this beet, peach and burrata salad. This is the one summer recipe that you still have to make–and I don’t know how much longer good peaches will be available (maybe another week or two? ), so you might need to move quickly. I mean, beets, peaches, burrata, candied pistachios, and basil oil. It does not get better than this. Also, I realize this is the third recipe that I’ve asked you to make that calls for basil oil (first, these shrimp skewers and then, this hash), but I love that stuff. It totally makes this salad. I could also survive on candied pistachios, but that is besides the point. To be perfectly honest, I can’t take credit for the creativity behind this salad. This dish was inspired by the lovely Joe Yonan (food editor of the Washington Post and author of the recent cookbook Eat Your Vegetables). I was lucky enough to be introduced to him last year, and recently helped him with a private dinner event, where we served a salad very similar to this one. I ended up recreating and serving it a few weeks ago for a fancy dinner at home with Connor and my soon-to-be in-laws, where it was met with rave reviews, and eventually decided I needed to share it with you all as well. The best part of this dish is that it comes together so quickly. The most time consuming step is roasting the beets–my favorite method is to simply scrub them very well, wrap them tightly in foil, and roast them at 375 degrees for 45 minutes to one hour. The peaches are blanched and peeled very easily by scoring and placing them in a bowl, and pouring over boiling water (I used my kettle). 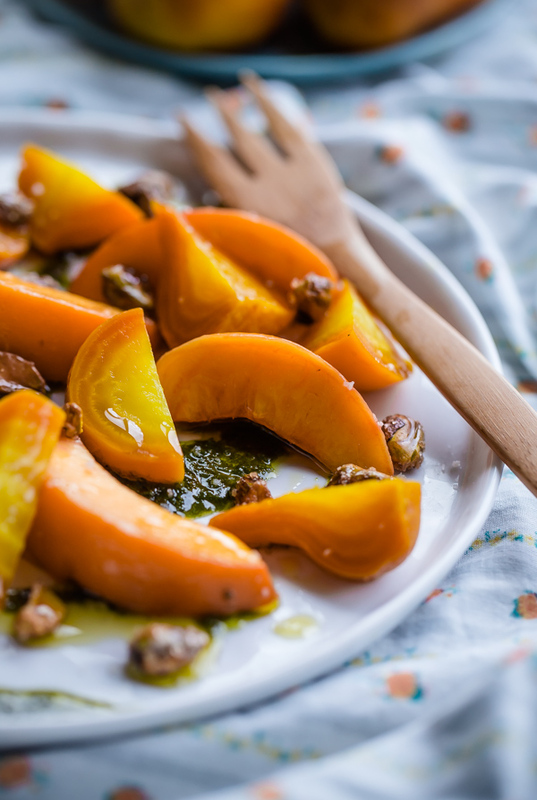 I’m not a huge fan of peach skin, especially in salads, and this step almost helps to bring out the flavor of the peaches even more, if that makes any sense at all. The icing on the proverbial cake is the creamy burrata cheese. If you’ve never tried burrata, it is essentially mozzarella that has been stuffed with cream. It is creamy, decadent, and best served at room temperature. It is one of my absolute favorite cheeses (or ingredients, for that matter), and although it is expensive and a little hard to come by, you will not regret the decision at all. Preheat the oven to 375 degrees Fahrenheit. Trim beet greens (set aside) and leave roughly half an inch of stem on the top of the beets. Do not remove the root. Scrub and clean the beets gently with fingertips to clean, without piercing or removing the skin. Wrap each beet tightly in aluminum foil, and place them on a small baking sheet. 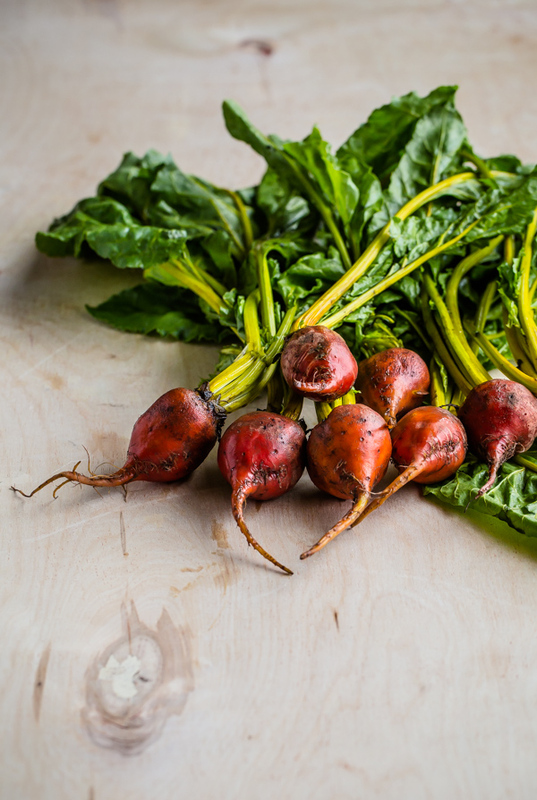 Bake the beets for 45 minutes (minimum) to 1 hour (time will vary depending on the size of beets). Check done-ness by unwrapping (be careful for steam) and piercing the center of the beet with a paring knife—if the knife meets no resistance, the beets are finished cooking. Meanwhile, combine the pistachios in a small bowl with the granulated sugar, 1 teaspoon of water, and a pinch of salt. 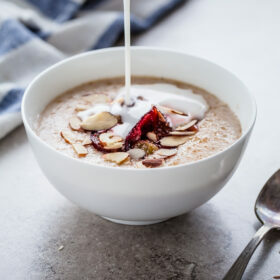 Place the pistachios on a small baking sheet, sprinkle with the turbinado sugar, and toast for 10 to 12 minutes (in a 375 degree Fahrenheit oven, either by themselves or with the beets), or until caramelized and golden. Allow the pistachios to cool completely on a rack. Wait until the beets are able to be handled (they will be easier to peel when they are still slightly warm). Peel gently with fingers, remove root and tail, and slice into half-moons or wedges. Cut a thin “X” on the bottom of each peach. 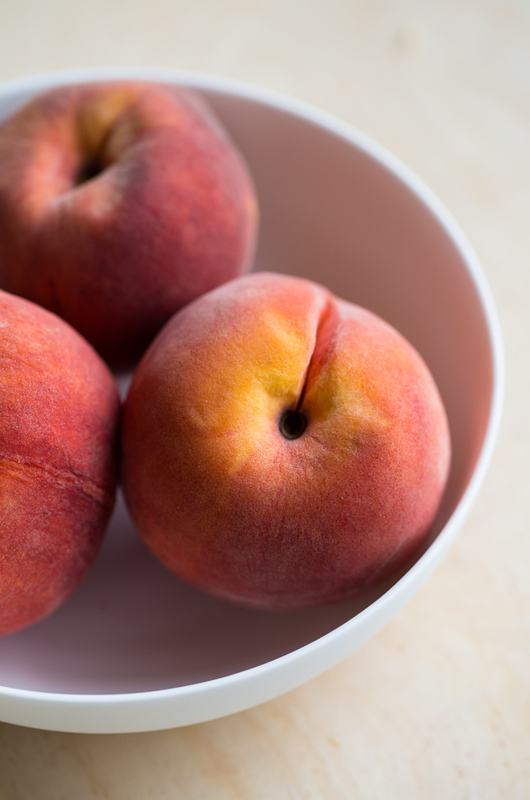 Place the peaches in a bowl and cover completely with boiling water. Allow the peaches to blanch in the hot water for at least 5 minutes, or until the peel is easily removable. Right before serving, slice the peaches in half, core, and cut them into wedges. Drizzle the plate with basil oil. 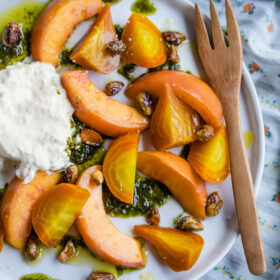 Distribute the peach and beet slices amongst the plates–place the burrata on a paper-towel lined plate, and place one half of a burrata round on each plate. Add more basil oil as desired. Drizzle the plate lightly with high-quality olive oil and sprinkle with flaky salt. Add candied pistachios and serve immediately. Roasted and peeled beets can be prepared up to 2 days in advance, and kept in a container in the fridge. Feel free to halve the basil oil recipe; however it will last in the fridge for 3-4 weeks (and can be used for a variety of other dishes!). Candied pistachios can be prepared several days in advance. I’m so happy that you ended up sharing this salad recipe with us. Love all the flavors in this. I’m so glad I did too! 🙂 Thanks Meagan! This is what I call end of summer perfection! 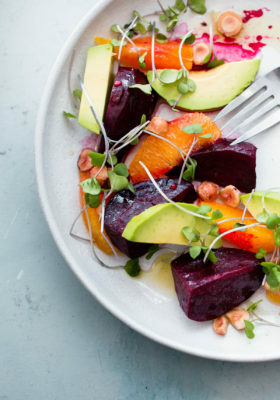 I have everything on hand, so now I just need to crave in the time to make this gorgeous salad. LOVE everything about it! I met Joe Yonan last summer at the Big Summer Potluck… such an inspiration! This salad looks and sounds ridiculously yum. Isn’t he amazing? Love him! I’m so happy to have been introduced to him, and gotten the chance to work with him a bunch of times over the past year. His food always inspires me! This looks like an incredible celebration of the end of summer! I love the combination of flavors. Thanks for the tip about peeling peaches, I didn’t know about the boiling water trick! Connor assures me that this was delicious. Beets are probably one of my top five favorite foods on the planet, I can only imagine how much I would love them paired with all of these other ingredients! 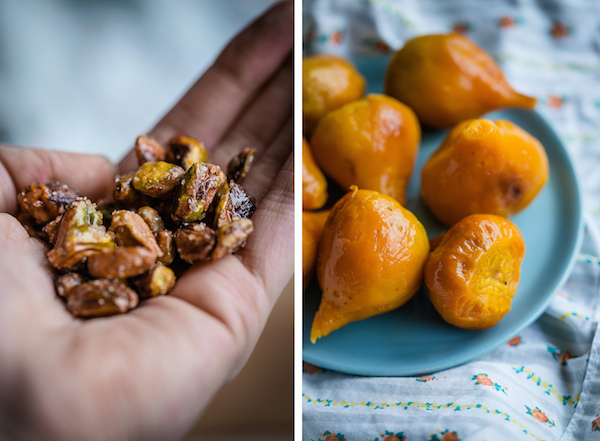 Candied pistachios — omg. Candied pistachios are sooo good! I was nibbling on leftovers all day. Thanks Nicole! Yes! It lasts so long and is good on EVERYTHING. Ditto with the whole jaw dropping action! This looks SO delicious. You never fail to get me craving something way too early in the morning. Thank you so much Graham! 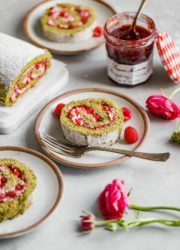 This looks positively scrumptious! 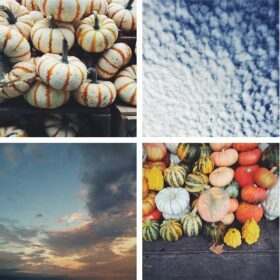 I’ve never tried burrata, but it seems to be appearing on lots of my favorite blogs lately. May have to indulge! 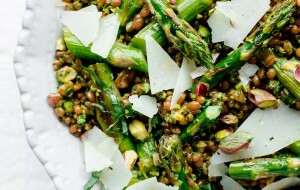 This salad is a total dream!! Loving all the flavours in this! I’ve got the peaches covered! That’s an easy one 🙂 They’re so good! 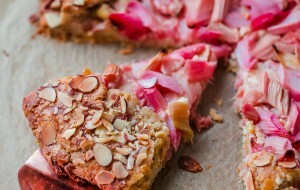 And I love the use of beets and candied pistachios. You rock the salads Laura! 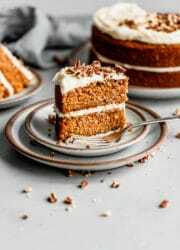 I get stuck in same old same old and love finding new recipes. Pinned! Whoa! The flavors here are out of this world. 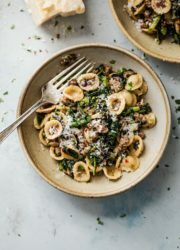 I love pistachios and that basil oil sounds phenomenal. This is beyond gorgeous! I actually have everything to make this (beets already peeled and roasted, too), and C is out for dinner tonight. You KNOW I’m making this!!! This salad looks and sounds so tasty! Burrata and peaches alone would be excellent, but the extras here are extra delicious. I echo everyone else’s lovely comments and awe over the looks of and flavors in this salad! In fact, I am following your advice right away and making it tonight! I do have to use cubed frozen basil, though, and nectarines! But it should be scrumptious and so different than our regular fare! Thanks, Laura! It should still be good! Hope you like (liked?) it! Wow! Just wow! I love everything about this! Candied pistachios?! Love! I love beets, tons ! Anyone who doesn’t like them, well, I’ll eat their share! And the Candied Pistachios!! OMG. Pinned! I love beets too! Especially the golden ones! Thanks Averie! Wow, that does sound like an amazing send-off to summer. I’ve never combined beets and peaches, but now that you say it, I can’t believe I never thought of it. Lovely. I love beets, especially the golden ones! And basil oil is the best, so feel free to use it in more recipes! 🙂 This is a gorgeous salad. I can see why it was a winner. Me too! They are much less messy too. Can’t get over my love of the basil oil, and it lasts so long! How lovely! 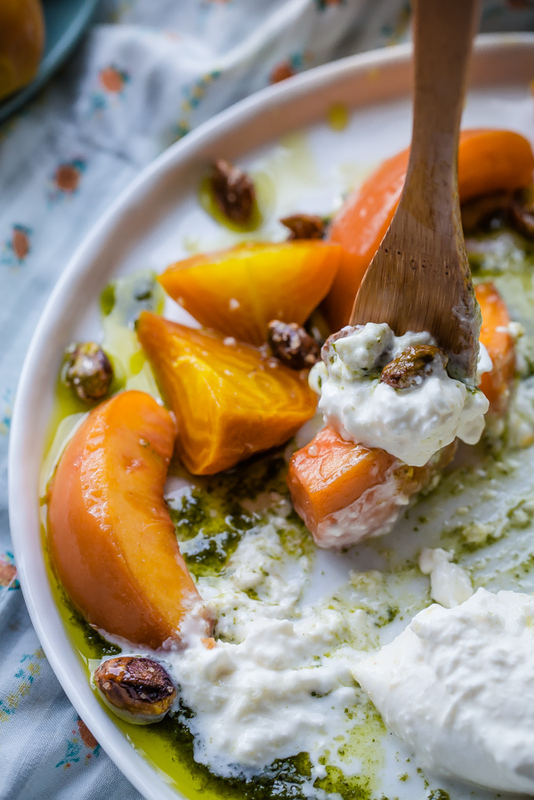 I love that you caramelized the pistachios … and thanks for the description of burrata. I’ve seen it in so many recipes but you made me realise I had no idea what it was! No problem! It is like a much, much better mozzarella 🙂 You’ll love it! You’re right – it doesn’t get much better than this! We’ve got just a couple bins of peaches left at the market and I’ve been hoarding them every time I’m there. I need this salad in my life – adding to the dinner plan tonight! Thanks Sarah! Let me know if you make it! Candied pistachios?! And I could basically eat bur rata for 3 meals a day. This is so dreamy. As a huge peach lover and a big fan of bur rata, this salad is definitely calling me. Gorgeous shots, as usual! Eating it for lunch right now – yum yum! Yay!! Thanks so much Sarah! Glad to hear you enjoyed it. Currently moaning in a ridiculous way given that I’m still at work. But this just looks so good! I want to live in these pictures…I would sit right there in that creamy burrata. 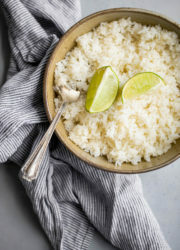 I like to save recipes to my FB page but don’t see a FB link. 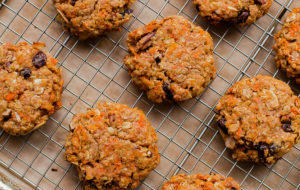 You would have to share the URL of the recipe, and then save the subsequent post! Sorry! The individual components are lovely, but neither my husband nor I thought that the salad as a whole made sense. Maybe using frozen peaches let us down? The burrata and the carmelized pistachios were heavenly together, but neither the beets nor the peaches tasted good with either component. The basil oil was unsurprisingly lovely on the burrata, but it tasted odd on the beets and unpleasant on the peaches. Hi Kali! Sorry to say this, but I really think the frozen peaches were the downfall. This flavors of this salad are really contingent on having amazing, fresh, ripe, sweet peaches – and frozen peaches are sort of notorious for being under ripe, tart, and not good for pretty much anything but smoothies and maybe a pie (if you’re stuck!). I would think just that factor alone would make everything seem sort of off. 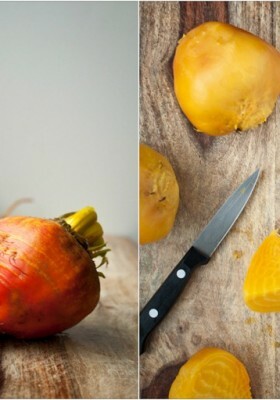 Did you roast golden beets from scratch? This is also really important!